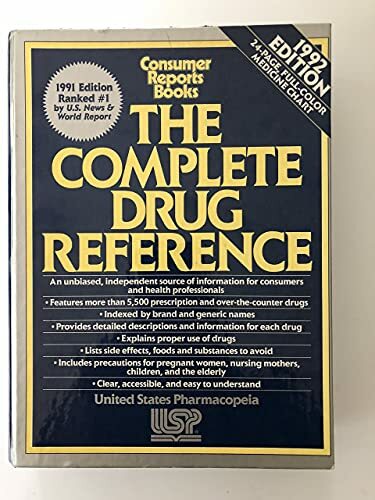 A comprehensive guide to more than 5,500 prescription and nonprescription medications identifies each drug's generic and brand names; describes its use, possible side effects, and allergic reactions; lists the drug's interaction with food and other drugs; and more. This terrific source of straightforward information on currently marketed prescription and over-the-counter drugs is written in language aimed at the layperson. More comprehensive in terms of coverage than the Physician's Desk Reference (Medical Economics, 1990. 44th ed. ), its text is also more consistent and logically organized (alphabetical by generic name, instead of by manufacturer), and the typography and layout is far easier to read. A glossary, photographs of commonly prescribed tablets and capsules, indexes by trade and generic names and categories of use, and appendixes on chemotherapy regimens and precautions for pregnancy, breast-feeding, and athletes are included. Librarians should note that the same volume was published simultaneously by the USPC as USP DI, Vol. II, Advice for the Patient and previous editions published by Consumer Reports had the title United States Pharmacopeia Drug Information for the Consumer . Highly recommended for libraries of all types and personal col lections.